Canada Mom Deals - Deals, freebies, and more for Canadian Moms: Advertise Here! Are you looking to reach new Moms and Dads in Canada? Canada-Mom-Deal.com fills a void in Canadian-based online content: it focuses on sales and specials on products and services of interest for new Moms (and Dads too!) in Canada. 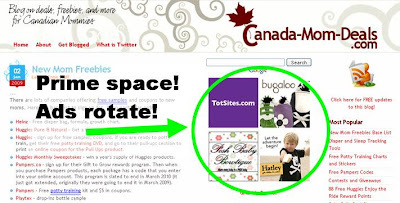 Advertise your product or service here and catch the eye of the Canadian parent. Canadian parents WANT to find you! Moms are always looking for new and innovative products that will benefit them - and Canadian Moms love to shop Canadian! Ad will display in a maximum 2 x 4 grid of ads. Ads rotate every time the page is refreshed or if the user navigates to a different page. Affordable pricing: 30 Days for $10. Advertising can start on any day of the month - you will receive an invoice after the ad is posted, with the start date of the ad. Don't forget you can always submit your sale information for FREE promotion on the blog, too, for double the exposure! Advertise for less than $1 a day! to start promoting on Canada-Mom-Deals!